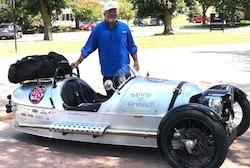 Freeman Completes His 48 State, 16,423 Mile Morgan 3 Wheeler Trip in 79 Days. The Culmination Of A Dream – Will Freeman Completes His 48 State, 16,423 Mile Morgan 3 Wheeler Trip in 79 Days. 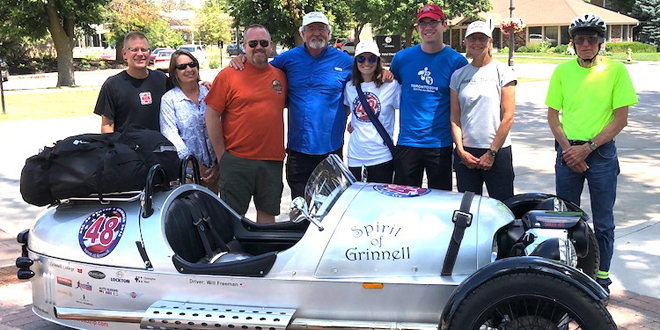 Full of excitement to be home after setting a world record in Morgan 3 Wheeler (dubbed the “Spirit of Grinnell), Grinnell College Professor and Coach Will Freeman arrived back in Grinnell with a wind burned and tan face to a crowd of friends, family and supporters. According to Abby Reding, an ourgrinnell.com freelance correspondent, “For him, lengthy travels are about appreciating the different places, meeting new people and trying new things”. In an interview with Our Grinnell’s OG, Will, during his celebration at Central Park in Grinnell said of this adventure, ” First of all ‘Follow your dream, I’ve always wanted to do this’ and secondly, ‘It’s a big country and every state was different and unique and had something special to offer’, ‘but the big take away was the people, the surprising people I met along the way and interviewed along the way for the book project that will follow, it was really about the people, the premise anyway was to meet people, find out about their life journeys and write about it’ “. Freeman indicates in his next to last blog, and by the way, he had a daily blog on his website, m3wroadtrip.com, that he was emotional about this “once in a lifetime” trip coming to an end. “I have been on the road for 79 days and tomorrow “I’m in a different mindset, one that I’ll have to adjust too”. With this comes the compilation of material from all of the 79 days, 48 states and 16, 423 miles, the final blog, and the beginning of his book. 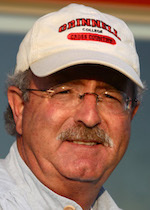 Will Freeman can be reached at freemanw@grinnell.edu and is available for speaking engagements.